Brushes in the kitchen serve a multitude of purposes: they can spread egg wash or glaze on a pastry before baking, coat a piece of bread with oil or melted butter for crostini-type items, or baste meat with pan sauces or marinade. You can use them to whisk crumbs from a cake before frosting or to spread pizza sauce over dough. Small brushes can also be used to apply water or egg wash as a seal to the edges of dough for ravioli, dumplings, and turnovers. You should have a couple of different brushes in your repertoire, keeping the ones used for sweet and savory applications separate… after all, you wouldn’t want your sweet pastry to taste like the garlicky marinade you used for last night’s chicken, would you? Silicone-bristled brushes are easy to clean, but are best for thicker sauces, such as barbecue sauce. Thin liquids like olive oil, vinegar-based marinades or butter will get a better application with a paintbrush-style brush that has finer bristles, such as natural boar bristles or the synthetic version. Some brushes, such as those with silicone bristles, are dishwasher-safe. Paintbrush-style brushes (i.e. natural boar bristles), particularly those with wooden handles, should be hand-washed; work liquid detergent and warm water into the bristles, rinse well, squeeze the excess water from the bristles, and air-dry, bristle side up, in a small glass. Keep in mind that natural bristles can shed, and need to be replaced eventually as the bristles get residue build-up. Some brushes are self-basting, with a hollow handle that can be filled with your basting sauce. While these are convenient, they might be more difficult to clean and to control the amount of liquid used, than an ordinary brush. Keep your brushes used for sweet and savory applications separate by labeling them with a permanent marker. Take a look at the wide variety of culinary brushes available for every need. 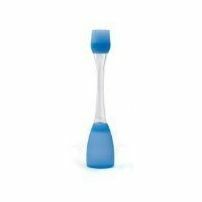 This silicone-bristled brush has a two-in-one purpose. You can use it solely as a brush for marinades, or you can use the baster feature to pull up juices from a pan or roaster, then release them through the bristles to baste. The base is flat so it stands up on its own on a countertop, eliminating messes. The generously sized, 2-inch boar bristles are best for broader jobs like basting a roast or slathering larger pastries with egg wash. The handle is wooden and bristles are reinforced with a plastic band. This brush must be hand washed. The long, 14-inch handle of this brush has an angle, which is great for basting food on the grill or reaching deep into the oven to baste a roast. Bristles are heat-resistant silicone, and the brush is dishwasher safe. The 1.4-inch size of this pastry brush is ideal for applying a glaze or wash to delicate, individual pastries and tarts. The natural bristles are cut in a curve for more precise coverage and are sheathed in plastic. The handle is stainless steel wire, shaped in a loop for hanging. The best part is, the bristle head can be replaced or interchanged (additional heads sold separately) for sweet and savory applications. This silicone-bristled brush comes with a little pot, just the right size for melting butter or making a barbecue sauce. The brush has a stainless steel handle with a loop for hanging, and the pot is stainless steel with a nonstick coating. It measures 4 1/2 inches in diameter.